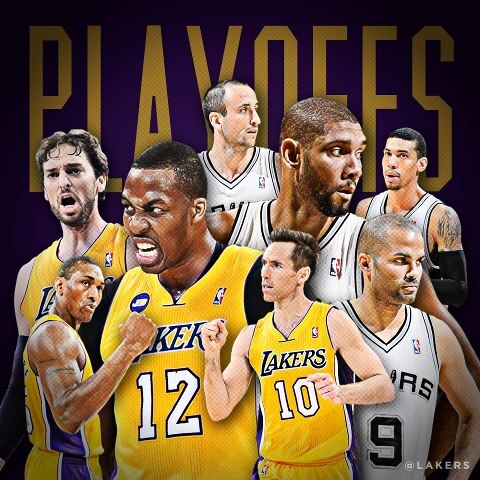 # 7 Lakers vs # 2 Spurs! NBA Playoffs! I love this game! Hey there. I'm a huge sports fan. I strongly support the Los Angeles area teams but really, I'm just a fan of the sport. Whether it be basketball, football, hockey, or baseball, I'll support the local teams because I just love the thrill of competition. For as long as I can remember, I have been a Lakers fan. I've seen them win with Magic Johnson, I've seen them win with Kobe and Shaq, I've seen them miss the playoffs, I've seen thm steal Pau Gasol from the Grizzlies, and I've seen them assemble this "super team" of Steve Nash, Pau Gasol, Kobe Bryant, and Dwight Howard. This season was to be season where the Lakers steam rolled through the NBA. The season where the Lakers play the unstoppable force going up against the NBA. Last night, the Lakers made the NBA playoffs... as the 7th seed. It's been a tumultuous season for the Lakers. Mostly frustrating, partly exhilirating, all with a touch of Hollywood drama. Here are my thoughts on the Los Angeles Lakers 2012 - 2013 NBA season. The season really started in the offseason. The Lakers shipped off Andrew Bynum, obtained Dwight Howard, and acquired Steve Nash. 4 stars on a single team. It seemed like the Lakers would be on a collision course with the Miami Heat to meet in the NBA Finals. But with new additions came risks. Howard was coming off of back surgery and the Lakers didn't know when he would be back and whether he would be a dominant force when he returned to action. Steve was 39 years old and is known as a poor perimeter defender. Both instances were liabilities at the start of the season, but I didn't think it would start off as bad as it did. I figured that with Kobe and Pau on the team, we should be able to muster a solid start, at least until Dwight could be back into form. NOPE! We lose games right away, Coach Mike Brown is fired and Coach Mike D'antoni is hired. Now, the season started off bad and I blame the hasty decision to hire Coach D'antoni to blame to the poor start of the season. The Lakers played well below .500 ball for the first few months and I strongly believe it's because D'antoni tried to install his "run and gun" offense on this Lakers team. Let's be honest here, folks, the Lakers are an older team. They simply do not have the pieces to play that kind of offense and it felt like D'antoni was forcing it on the Lakers players. It just wasn't working and the Lakers were losing games. And on top of that, there was talk of tension in the locker room. Dwight's fun loving ways was irking Kobe. Nash was getting tired of being stuck in the middle and didn't want to get involved. The locker room was divided. Then... the injury bug hit. 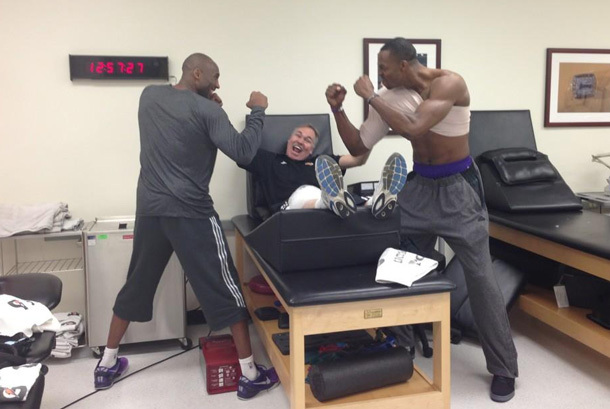 Kobe and Dwight about to throw it down? Dwight sat out the first few months of the season due to his back surgery and recovery. The first few months, Steve Nash played but was eventually hit by the injury bug. Jordan Hill is out for the season with a back injury. When Dwight returns, soon after, Pau Gasol is out for with a foot injury. Upon his return, Metta World Peace is out with a knee injury (but miraculously returns in less than 2 weeks after sugery). Steve Nash is out again with a hamsting injury. 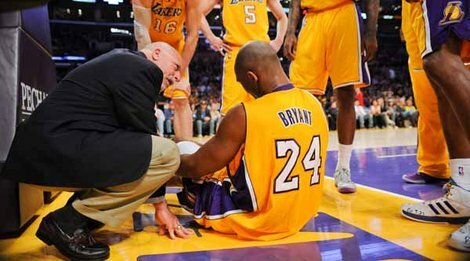 And it to top it all off, Kobe tears his achilles tendon in the final games of the season. For a team that was supposed to be a super team, they couldn't defeat the injury bug. This season felt lost. It felt wasted. The Lakers just couldn't get all the pieces of their team on the floor at the same time. By the All Star Break, they were close to 7 games UNDER .500. This is not a playoff team. And it was frustrating to watch. But these are the Lakers, of course they'll get their act together and get back into the playoff race! The Buss family knows what it's doing and surely they've built a winning team in Los Angeles, right! Jerry Buss will make sure of it! But then... tragedy struck. Dr. Jerry Buss passed on during the season. He was battling cancer and he was instrumental in creating the Los Angeles Lakers to what they have become. From the Magic to Kareem Lakers, the Shaq and Kobe Lakers, to bringing Dwight Howard and Steve Nash to the Lakers, Jerry Buss is the brains behind all the big moves. And now, he's gone. There's no doubt that he has passed on strong business sense to his family, who now run the Lakers, and I'm sure the Lakers will continue to be a successful franchise to years to come, but to lose Jerry Buss in a season that was already full of adversity could have spelled doom for this Lakers squad. 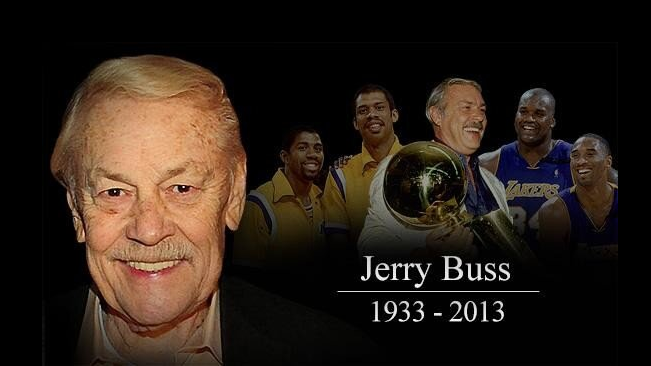 Thank you for everything, Dr. Jerry Buss! Slowly but surely, they started to string a few wins together. The clawed thier way back into the playoff race. Sports pundits predicted that the Lakers would need at least 42 games to get into the playoffs and thier schedule was doing them no favors by pitting them against some tough teams down the stretch. Kobe guaranteed that the Lakers would make the playoffs and man, were those last 10 games of the season something to behold. Many times, Kobe "willed" the team to victory. He played well over 40 minutes in those games and was making unbelievable 3 point shots in an effort to keep the Lakers in contention. He simply looked unstoppable. I remember watching a game on TNT when Reggie Miller made a comment on Kobe saying how Father Time is undefeated but that Kobe is winning the fight. That resonated with me. Kobe is only 34 years old, but the man has been in the league for 17 seasons. And that's not including all the playoff games and international games that he's played. Let's be honest here, Kobe has some serious miles on him and he may have pushed himself too hard and his body finally gave out on him. I remember watching the game where Kobe torn his achilles tendon. It seemed like his leg just gave out on him when he tried to go around a defender. He tried to walk it off. He hit 2 free throws and then was helped off the court and straight into the locker room. The man is tough as nails and as a Lakers fan, we are spoiled by Kobe's great play, strong determination, indestructable body, and seemingly impossible shots that Kobe makes time and time again. He's shooting free throws on a foot that is unattached to his body is simply amazaing. But now, he's down and he's out and Kobe is scheduled to be out for 6 to 9 months. I wish the Black Mamba a full and speedy recovery. Through all the turmoil and difficulties surrounding the Lakers this season, it feel like the basketball gods decided that the Lakers should play on EXPERT mode. EVERYTHING was thrown at them and they continued to claw and fight their way into relevance. They fought all the way until the final say of the season. A win against the Rockets would move them into the 7th seed of the Western Conference. Earlier in the evening, the Jazz handed the Lakers the 8th spot by succumbing to the stout defense of the Memphis Grizzlies. With a Lakers win, they avoid playing the top seeded OKC Thunder and play a more favorable matchup against the second seeded San Antonio Spurs. The Lakers were down early in the game, but turned it around the 4th qtr. The Lakers, up 3 with seconds to play, played tough defense but the Rockets managed to pull a rabbit out of their hat and hit a desperation 3 pt shot. The game went into overtime. Of course it did. It was only fitting that the Lakers needed scrap with the Rockets for another 5 minutes to decide thier fate. In OT, Pau Gasol hit jumpers and Dwight Howard blocked shots. A winning combonation! Lakers win and moved to the 7th seed. The Lakers were happy, I was happy, Lakers fans everywhere were happy. But why? 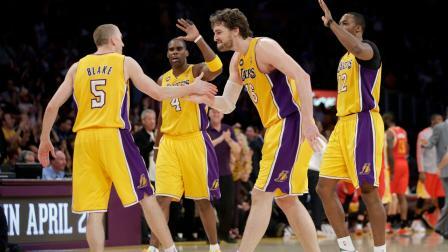 Pau Gasol looks assertive while celebrating the Lakers win against the Rockets! The Lakers are a team of championships. They don't hang division winning banners (sorry Clippers fans) and the Lakers are always in contention for the top spots in the West. That wasn't the case this year. This year, we saw a different Lakers team. One that didn't steam rolled the competition. One that didn't seem to scare the opposition. One that was definitely down, but not out. One that dealt with adversity the only way it knew how, by punching it in the face. For thier efforts, they managed to snag the 7th seed and they couldn't be happier. Not because they are in the playoffs, but because they know this team has plenty of fight of in them and they will not go down easy. This Lakers team was destined for greatness from the start of the season and only now they are beginning to find their groove. Even with thier captain now on the sidelines, the Lakers move on the playoffs and you can't help but see Kobe's spirit in Dwight Howard's play, Steve Blake's shot, and Pau Gasol's agressiveness. Kobe may not be with the team, but his determination is there in the Lakers' eyes. Watch out, Western Conference, the Lakers have finally arrived. Later! one of my coworkers loves the lakers too.